Not every home security camera is going to make a good pet cam. In fact, most home security cameras are designed to ignore pets. If you want a camera that can watch your home and also your pets, there are some basic features you should look for. First of all, you will need a camera that can either pan and tilt or one that offers a wide angle. Pets are mobile, but they are also shorter than a human-being. You need a camera that can capture a wide area including height so that you can capture your dog who is napping on the couch, but also your cat who is perched on a shelf. Second, two-way audio. Being able to communicate with your pet while you are away can ease a lot of pet parent guilt. A system with two-way audio allows you to hear your pet, but also speak to them. You can do this using your smartphone so long as you’ve downloaded the appropriate app and you have a 3G or 4G connection. Three, ideally you will buy a camera that also protects your pet. Home fires kill 40,000 pets every year and there are other dangers lurking at home as well. 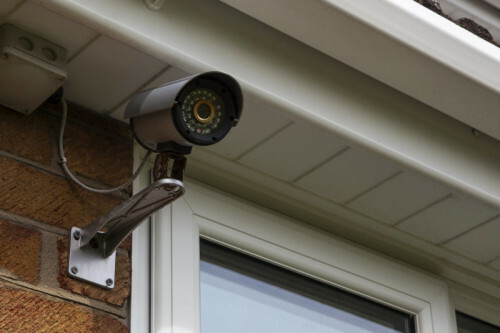 The right security camera can monitor and alert you of rising temperatures or can monitor for loud sounds. This can include things like smoke alarms, security system alarms, or even incessant barking. The Piper nv has all three of the recommended features and more. It offers a 180 degree field of view, two-way audio, and plenty of sensors. It can record and detect sound, but can also alert you if your home’s temperature gets too high or too low. On top of protecting your pet, the Piper nv can automate your home. You can connect smart home lighting to the camera, set to turn on at night or when you are away so that your pet is never left in the dark. You can also monitor doors and cabinets. If there is a door that must remain closed for your pet’s safety and you forget to close the door, Piper can send you an alert. The Piper nv records in FHD and comes with a free mobile app. It also includes free cloud storage so that you will never miss a moment again. Nest Cam also includes all three recommended features and does have one advantage over Piper – size. As it has such a small size, the Nest Cam can be wall mounted to keep it away from curious pets. It has a 130 degree field of view which may sound small compared to Piper’s 180, but it’s sufficient for capturing a large room. It also includes two-way audio and can record and detect sound. Nest Cam cannot turn your home into a smart home on its own, but it is part of the Works with Nest program. You can connect the camera to the Nest Learning Thermostat or the Nest Protect smoke alarm for a connected house. It can also record in FHD. In regards to picture quality, Nest Cam is one of the best. Nest Cam also includes access to a free mobile app, but it does not include storage. If you want storage, be prepared to pay. The SmartCam has a 128 degree field of view, two-way audio, and sound detection. It is the only camera of the three options that can support an SD card for local storage. It also includes motion zones. Let’s say that your dog is not supposed to get on your couch while you’re gone. With Motion Zone Select, you can tell the camera that you only want a notification if motion is detected on your couch. If he sneaks onto the couch, log into the included app, and use the two-way audio feature to tell him to take a hike. On the other hand, you won’t be inundated with alerts as he walks around the house. You will only receive alerts if he gets on the couch. In all fairness, Nest Cam offers this feature too, but they charge a monthly fee for access. The Samsung SmartCam includes access to a mobile app where you can set customized push alerts. Checkout this link to compare Piper and Nest Cam in further detail. While all three cameras are good options, each one is a little different. If you want to add sensors and home automation, Piper is the best. If you only care about clear footage, Nest Cam is the best. If the idea of Motion Zones excites you, SmartCam is the best. What do you think? Have you tried using a security camera to monitor your pet’s activity?